Which Volvo Is Next Go? - Cars! Cars! Cars! Which Volvo Is Next Go? So we're reading the blokes at autoblog who wrote: Sinking Swede? Ford devalues Volvo. First of all, way to hurt Volvo's feelings. Leave it to an airplane dude to be so cold and callous (but, nice hair). Second, eh, we'd devalue them, too. So, what we're getting at is -- a new Friday game! That's right. This new game is What Vehicle is (manufacturer) Going To Kill Off Next? So, who is in the running? Well, maybe the S40, S60, V50 and V70. 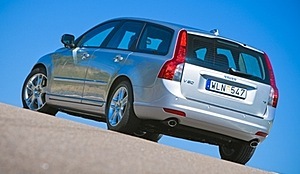 Let's boot out the V70 because it's going to be all new for 2008 (the current V70 was very long in the tooth... but the new V70 gets frakkin' horrible gas mileage... holy cow must Volvo engineers be feeling mighty low at this point). So, we have the S40, S60 and V50. Let's also boot the S60 because Volvo is rumored to be making the XC60, so maybe that means an upgrade for the regular S60 as well. So now we're down to the wee S40/V50. We recall reading Volvo is interested in a 5-door version of the C30 (which is a horrible mistake), we think the next Volvo to get the axe will be: V50. Long live the Volvo V50. Screw the V50. It's cool, but for $36k? Frak that.